The Gingerbread man, a lethal serial killing cookie, has escaped from prison and is rampaging through Reading. But Jack is off the case – his unfortunate miscalculation that involved Little Red Riding Hood being swallowed by a wolf has left him with a bad reputation and he’s officially suspended – but also free to pursue a related missing person’s case. As he deepens the search (and continues to haunt the Nursery Crimes offices) for the missing Goldilocks, clues eventually lead to the Three Bears and the greater Ursine community and soon a whole conspiracy is revealed involving Porridge, an MP, a huge multi-national corporation and some giant cucumbers. It’s another whacky mystery in Berkshire, where fairy tales are real, where anthropomorphic bears roam around and get high on illicit porridge. Where characters from a nonsense poem run one of the world’s biggest corporations, where Dorian Gray sells unaging cars, a serial killing gingerbread man and binary-speaking aliens manage to be even more dull than most people. This has so many of the classic elements of the first book – taking fairy tale dramas and working them into reality often hilariously (even in tiny little side dramas – like the Dish and the Spoon eloping to Gretna Green) and generally filling a very twisty, fascinating and nuanced mystery with lots of the fantastic, the silly (and outright recognised as such) and humour. And that’s important – because it does take a twisty, fascinating and nuanced mystery with lots of epic conspiracy and clues and knotty problems that would be good on its own right – it doesn’t rely entirely on the excellent silly fun to make this book work. I think there is a slight moving away from actual fairy tale characters in this book – though they are still very much apparent (such as Godlilocks and the three bears), since a large number of the characters are actually from a nonsense poem by Edward Lear. Equally, I think there was less of the detective snark and parody that I so loved in the first book – the Guild of Detectives was less in evidence and the newspaper excerpts were less apparent. We did have some great ongoing jokes about the various plot devices the detectives use to run their investigations which always made me laugh. The book went deeper rather than wider – rather than covering more fairy tales and fictional elements made real, instead it poked a lot more on what it means to have the fictional be part of reality. So we have Punch and Judy living their bizarre, violent lives and being drawn into it time and again, unable to avoid their cycle of constant violence (even if they are amazing marriage counsellors). 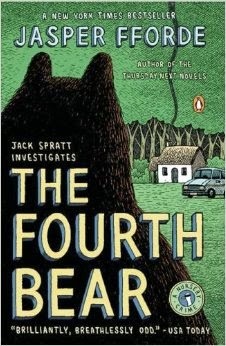 We have Goldilocks who, when entering the house of 3 anthropomorphic bears, could only go one way or Jack Sprat simply cannot bring himself to eat fat. Punch and Judy also bring another nuance – their stuck narrative has left them anachronisms in the modern world – their constant violence against each other grossly repellent to modern sensibilities even while the ongoing telling of their story keeps forcing them down the same narrative path. Beyond being trapped by their narratives there’s also the existential uncertainly of being a, well, fictional being. Jack spends a lot of his life in active denial of the fact he’s a PDR (Person of Dubious Reality) and we have another character who virtually falls apart when she learns her whole life is pretty much a fake shell because she’s nothing but a living plot device. There’s also a lot of breaking of the 4th wall – and it works BECAUSE this whole book is about the idea of fuzziness between reality and fiction (there’s a rather gloriously lampshading of a super convoluted, yet hilarious joke that both Mary and Jack snark at the book’s author for setting up – and it works). The book is still hilarious, twisty, imaginative, completely off the wall and a joy to read – but I think, to me, it’s not quite as good as the first. This is more due to the extremely high bar that the first book set than any failing on the part of this book. I think the greater depth meant for a lot more examining of the world, but came at the cost of some of the fun – though the fun was definitely there in large amounts still. So there’s a lot of good here – but there’s some problems when it comes to marginalised people. Mainly, there aren’t any POC, LGBT or disable peopled – but all three groups are heavily appropriated from. And then there’s the straight MP who pretends to be gay and is horrified at the idea of being outed as straight which will ruin his career. I can’t even begin to unpack this in any book, I have absolutely no clue why anyone would ever think this was appropriate or even remotely a good idea – least of all in a book that has no LGBT people in it. I just… why is this even here? Why? What is the point of this? There’s also an ongoing issue with Jack being considered mentally ill – which is turned into an ongoing joke. And, yes, I did find the grossly inappropriate doctors at the mental asylum to be excellent “Mad Scientist” parodies – but the rest, the hostility to therapy, the casual reaction to PTSD and trauma and generally treating mental illness as something humourous or to be ignored. This book was, in some ways, very different from the first and though I didn’t enjoy it as much as the first, I appreciate it because it brought a whole new angle and depth to the delightful, hilarious and silly world of Jack Spratt and Mary Mary (who wasn’t quite as contrary this book). We went beneath the hilarious, fun surface to find some more nuance and development – yet still a nice big serving of fun and laughter to keep me smiling my way through it.